Angels), in our new Mexican Folk Art unit. 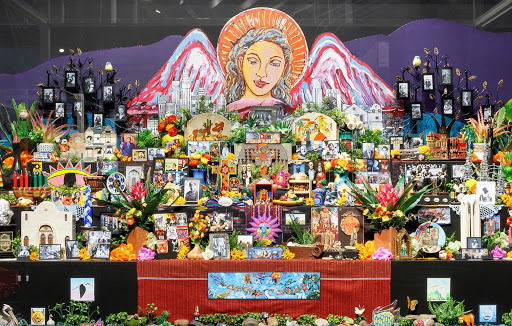 A new addition to our Mexican Folk Art unit: Ofelia Esparza’s Altar to el Pueblo de Nuestra Señora la Reina de los Ángeles (the Town of Our Lady the Queen of Angels), 2018. Image c/o The Art Docent Program. Ofelia Esparza, in a screenshot from Craft in America: Borders. Esparza learned the art of building ofrendas from her family, specifically her mother and great-grandmother, and helped to bring Día de los Muertos celebrations to the public sphere. Traditionally, as this wonderful episode of Craft in America points out, these celebrations were major community events held in graveyards. However, in America, graveyards were closed at night, forcing Día de los Muertos celebrations to take on a more private tone. 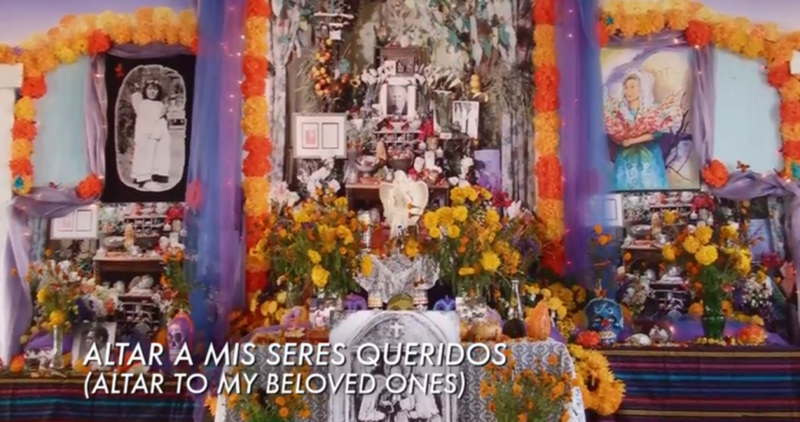 Ofelia Esparza’s Altar a Mis Seres Queridos (Altar to My Beloved Ones). Screenshot from Craft in America: Borders. 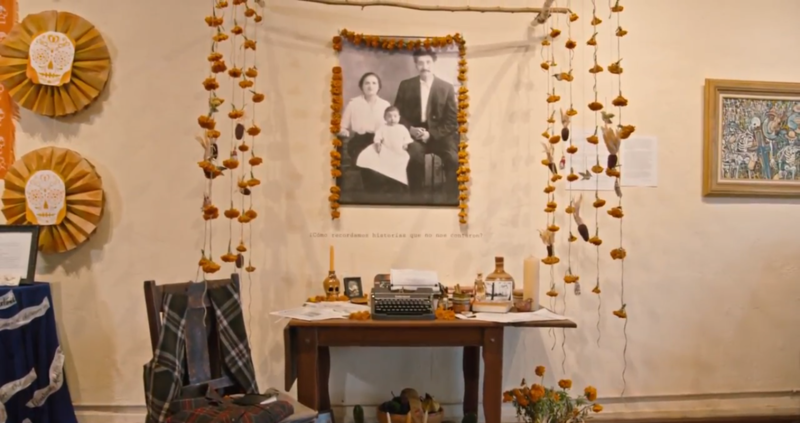 An ofrenda in Esparza’s studio. Screenshot from Craft in America: Borders. Esparza’s work isn’t limited to ofrendas: she works in printmaking and has created other “assemblages that address larger issues facing the Chicano community,” according to the NEA. Oh, and if she’s not cool enough, Esparza also worked as a cultural consultant on Disney’s film Coco. 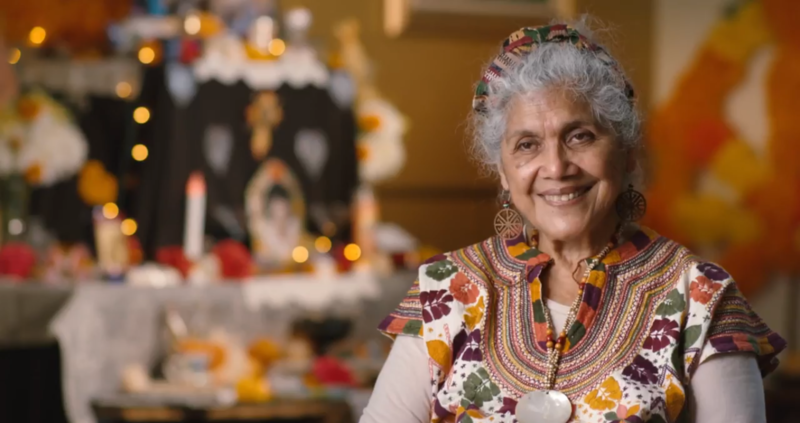 Read more about Esparza’s bio at the NEA and Craft in America, and watch her at work in the Borders episode of Craft of America. What do we do here at the Art Docent Program? Discover more about us here! Want more fun artist spotlights? Check out our blog archives, and follow us on Facebook for Program news!